I stopped by the garden yesterday after picking up some seedlings at the farmers market. Yes, I know I planted seeds just last week, but these will help tide us over until the seeds pop up. It’s arugula at the top of the shot, mizuna (a mild mustard green on the left), and lettuce (a romaine, I think) on the right. 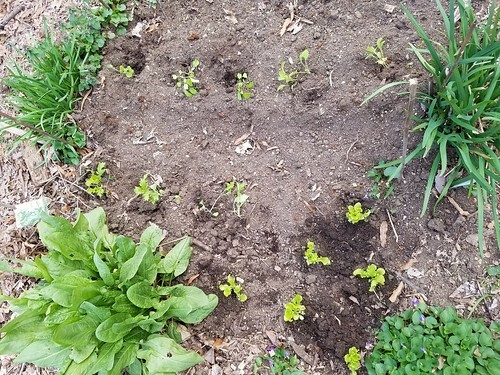 At the bottom of the shot is my sorrel, which reseeds itself every year. (The grassy things on either side are clumping onions, which I think we planted the first year we had the garden and which we just let grow wild. My croci petered out, but the daffs continue to look nice. I anticipate, though, that this will be the last week for them. 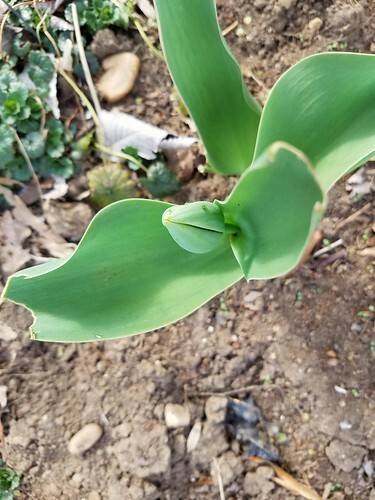 My tulip, however, will either bloom this week or next. Right now, it is sporting some very fancy green bugs that match its leaf hue exactly. 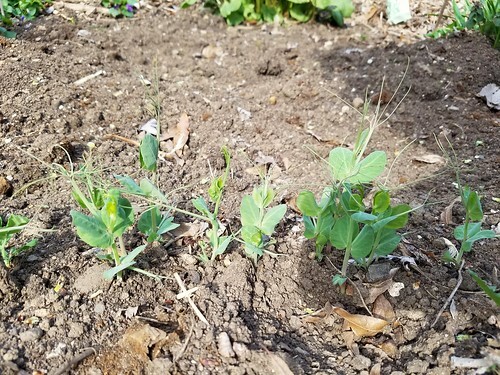 The peas did not yet have to be strung up, since their tendrils only stretched to the top of my hand. I think Rudi and I will tackle that this coming weekend, though, because they’re only a few warm days away from needing it, and those tendrils are a pain to unwind once they’ve decided to latch onto the wrong thing. 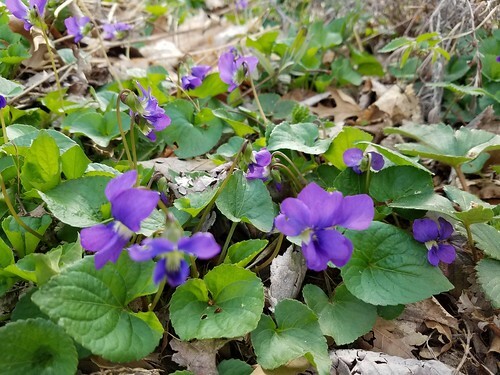 Finally, my beloved violets have emerged! I’d seen them out elsewhere in the neighborhood during the week, so I was hopeful mine had finally decided to unfurl as well. 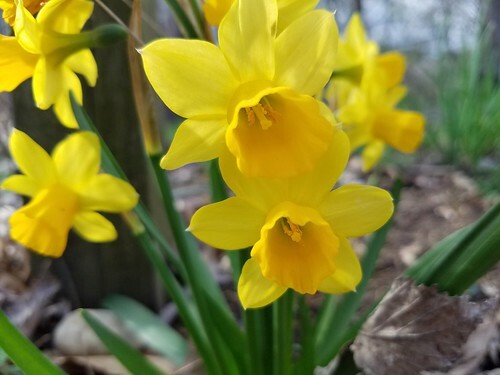 I did not collect a bouquet, since I was heading out, rather than home, from the garden, but I’ll be stopping back tomorrow or Wednesday for a nosegay (and some more in-focus photos).